Current location of Guardian Fidelity, Inc.
Postcard view of the old Andrew Jackson Hotel. Take note of the small building to the right of the hotel, reportedly the Roddey's kitchen, left when their home was razed to build the new hotel. Rock Hill parade ca. 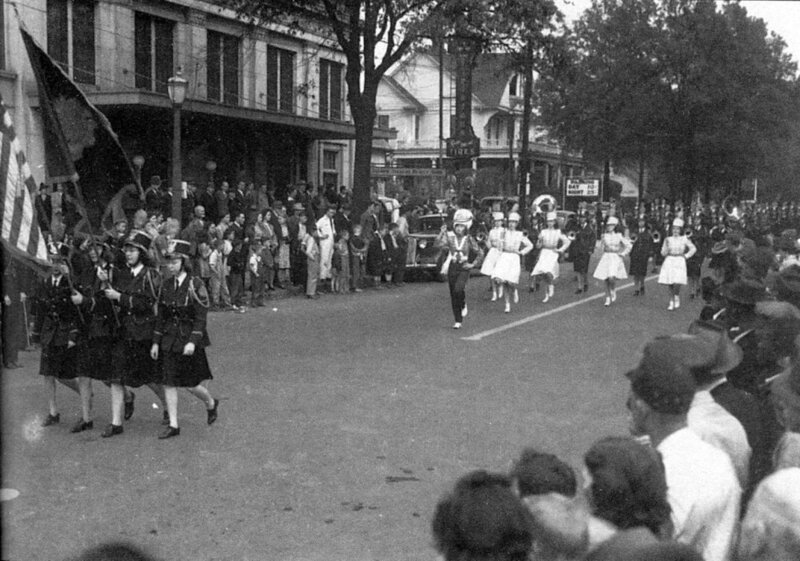 1940s showing the Andrew Jackson Hotel in the background (Lt), along with the Roddey House, what would later become the home of Bass Funeral Home. The funeral home later move to the Flower's home further out East Main Street. This lot was purchased in 1853 by S.S. Elam, a local artisan and contractor for $55. Elam built a house on the site, and in 1855, sold both the house and land to David C. Roddey, the most prosperous merchant in Rock Hill. Roddey’s widow, Mary E. Roddey, sold the Eastern portion of the town lot, to her brother-in-law, Captain W.L. Roddey. It was on this lot that the hotel was eventually constructed. The next lot belonged to Mary Roddey’s son, J. Edwin Roddey, on which he too constructed a fine residence. Both gentlemen built homes on the East Main Street site, prior to Oakland Avenue being extended from White Street thought to Black Street. Captain W.L. Roddey’s house was for many years the largest and one of the finest in Rock Hill. In 1926, a group of community developers purchased the land from the Roddey family. Their intention was to build the Andrew Jackson Hotel, meant to attract business and raise the profile of the already growing city of Rock Hill. Charles Coker Wilson, a noted architect throughout the South, was hired to design the building. His European training, at L’Ecole des Beaux Arts in Paris, was seen in the detail of the building, which opened on January 1, 1926. The Andrew Jackson Hotel became a center for business and social life in Rock Hill. It hosted many prominent guests, and the restaurant was a popular place for dining and civic meetings. The hotel was sold to a private company in 1946, and a decline in business in the 1960’s led to more hotels being built on the city’s outskirts. The Andrew Jackson Hotel closed, and the building was bought by the Guardian Fidelity Corporation. The building was extensively remodeled between 1984 and 1988, and today it is operated as an office building.